Forging Pattern: Very tight Itame. Dimensions: Nagasa: 26 15/16, Nakago: 8 5/8", Mihaba: 1 1/4", Sakihaba: 7/8", Kasane: 1/4", Sori: 11/16"
Mountings: The civilian saya is solidwith some chipping around the koiguchi. The tsuka is solid, no cracks. The fuchikashira are copper and the menuki silver or some similar colored metal. The tsuba is iron and in good condition. The habaki appears to be brass. 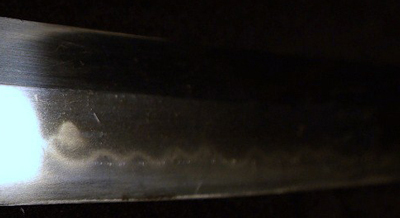 Overall Condition: The blade is in decent polish with minor scratches and can be enjoyed without being polished.